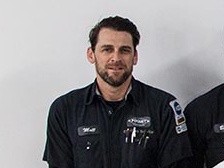 If your vehicle is serviced at Poquet Auto in Golden Valley, chances are Matt Merriam, Shop Foreman and long-time member of the team, ensures it's taken good care of. Learn more about Matt’s role at Poquet Auto, as well as a few interesting facts about his personal life! What can we find you doing on the weekends/favorite hobbies? I would definitely be boating and surfing in the summer and snowboarding in the winter. Otherwise, camping, hiking, and anything that involves being with my four year old son, Jackson and my wife Lisa. What is your favorite color of car? Depends on the car, but generally in the gray spectrum. Tell us something that might surprise us about you. Working on cars for a living, it is common to get poked, scratched, and cut, but, getting a shot or blood drawn at the doctor's will make me faint! What is your favorite part about working at Poquet Auto? The people I work with are great, it has a very “family oriented” feel and it really makes you feel involved and connected to the company. Also, the variety of cars that we see and service makes it very interesting and challenging at the same time. Trying to stay current with the changing technology and service procedures for multiple automotive manufacturers makes it exciting and helps keep us sharp. I am very lucky to work for a company that encourages and allows us to have the time and equipment to be able to stay current. Where is your favorite vacation spot? It depends on the season for me, and I rarely go to the same place twice. Lake Tahoe, Jackson Hole, WY, Maui, HI, and St. John, USVI are some favorites. What book are you currently reading/TV show you’re currently watching? Honestly I don't watch much TV and about the only books I read involve a cat named Pete or are written by Dr. Seuss! What’s the most interesting or unique job you’ve had prior to working at Poquet Auto? In high school I worked at a Jet Ski service and sales place near Lake Minnetonka and one of my jobs was to deliver Jet Skis to people's docks by taking the lake to them. If you need your vehicle serviced, make an appointment with Matt and the Service Team by calling us at 763-522-2000. These immaculate Cadillac CT6's have only 16,000 miles each! Whether you are looking to take out the 2016 Platinum AWD in Black Raven on 2017 Crystal White Premium Luxury AWD, we've got you covered! In love with the 3,000 miles, the Galaxy Blue Metallic and the warm AND cold packages! Features: Navigation, Warm Weather pkg, Cold Weather pkg, Heated/Ventilated Front Seats, Leather Seats, BOSE sound, Satellite Radio (subscription required), Vision pkg, Towing pkg, Rear Camera, and a Panoramic Roof. Take a look at this immaculate Black Porsche Macan AWD that has over $10,400 worth of options, only 18,400 miles, and an original sticker price $59,005! Features: Premium pkg, Navigation, Heated/Ventilated Front Seats, Leather Seats, Heated Steering Wheel, BOSE sound, Satellite Radio, Rear Camera, and a Panoramic Roof.